We went to Barnes and Noble on a family date night a few weeks ago and right there on the "new releases" shelf was THIS. Ok, I generally feel like I know about stuff. Even as a person who hasn't blogged in a while, I usually hear about upcoming things- promising new brands, interesting restaurants, new releases by famous authors. It's part of being in the blogging network- you just hear about stuff. But I had *no idea* The Chemist was coming out. I hopped onto my library app and apparently I was the only one who didn't know about The Chemist because the waistlist was like 300 people long. A few weeks later Janssen texted me and offered to share her audiobook version with me. There were still like 250 people between me and any copy from my library so I took her up on it and binge listened to it over the next few days. Let me begin by admitting that I have a very weird relationship with Stephenie Meyer. I can't put her books down but I also know they're kind of terrible. I hate that I love them. When I bought one of the Twilight books I hid it under a pile of clothing in my closet because I felt so conflicted about owning it. I do think her writing is getting better. 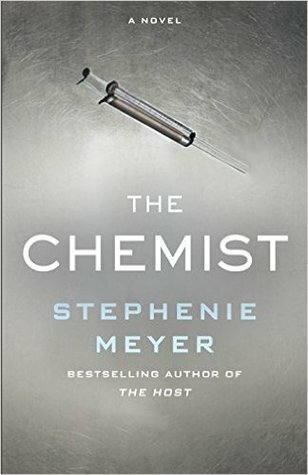 The Chemist is maybe her least terrible in terms of writing style (although I haven't read The Host in ages so I can't say for sure. But it's def better than Twilight with its endless descriptions of Edward's marble torso). And I have to give her props for trying out different genres- The Chemist is a kind of black-ops thriller. She dedicated it to Aaron Cross and Jason Bourne and you can see their influence. I quite liked the heroine. She's smart and capable which does my feminist heart good. Wimpy, moony Bella drove me bonkers through much of the Twilight series and Alex is kind of the anti-Bella. She can take care of herself and that was really refreshing coming from Stephenie Meyer. Downside: this is still a very Stephenie Meyer love story. They've known each other less than a week before someone utters the L-word. There's an assumption from early on that they're going to be together forever which would be reeeal creepy if they had just met on Tinder like normal people. Some of the love interest's dialogue made me a bit gaggy. LET IT BREATHE, MEYER. They can get together later in the book without these constant declarations of undying affection; why rush it?? Romantic tension just isn't her strong suit. She's more of the "throw them together and get it over with" type. Fortunately, the rest of the plot is really fun with a secret government agency and torture and revenge and awesome dogs so I enjoyed it. I have no idea how much of it would hold up under scrutiny but you can tell she did her research and tried to make it as plausible as possible. If you're a Stephenie Meyer hater, I doubt this one will sway you. But if you've enjoyed her other stuff then you should go grab this one. Then come back and talk to me about it because no one I know has read it yet and I want to discuss. Um, this is also the first I've heard about this book....so...minus 5 points to Meyer's marketing team!? I started it, but it was just SO SLOW for me. Granted, I was right in the middle of my monthly TV phase so it may have been hard for me to get into ANY book. I'll give it a go again someday. But you should really read The Host. I enjoyed the Twilight series as much as the next person, but The Host was a lot better. I have it, if you're interested in borrowing it. I had no idea this book existed and I too, have a love/hate with Stephanie Meyer. Happy to read it (or listen to it) and report back here. Thanks for sharing! I, too, have this weird love/hate thing with Stephanie Meyer, but when I heard that this book was coming out I knew I had to give it a shot. I still haven't read it, but it's on the list!